This is the time of year when many of us are in a “down time” when it comes to caring for our lawns. Sprinkler systems have been winterized and mulch has been applied to areas around the yard. If you are the type of homeowner who is always thinking about what’s next for your lawn, you might be considering employing a lawn care company once spring rolls around. If so, this is a good time to do some homework on lawn care companies in your area. Don’t assume all lawn care companies are created equal. The Better Business Bureau has some tips to use as guidance when choosing a lawn care company. Learn a little bit about the company. Check out the Better Business Bureau’s review. You will be able to learn things like the number of complaints against the company and if the company has responded to those complaints. You can also find out how long the company has been in business. Make sure the company is licensed and insured to work to do work in your area. Know what you want from a lawn care provider. Many companies provide a variety of lawn maintenance services. Determine what is right for your yard. Maybe you can handle your lawn’s water care but want help with mowing and trimming. You don’t want to pay for services you don’t need. Ask for a lawn inspection and a free estimate. This should be standard procedure for some companies but it’s always a good idea to ask. 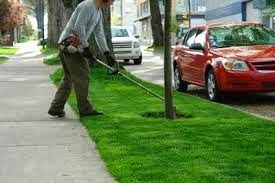 You should only get a quote after a lawn care professional has seen your yard but before any work is done. Get it in writing. You should receive a contract that outlines what work will be done. The contract should also provide details on a guarantee and a refund policy.